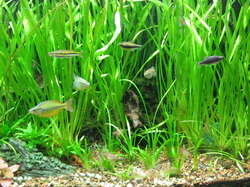 We stock a wide variety of community fish. 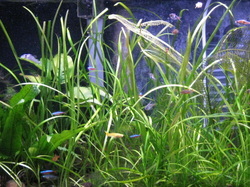 This is one of our planted aquariums. Received some nice fish this week, also some really nice small anubias on driftwood. Another one of our planted aquariums. We receive fish on a weekly basis. We try to offer a nice selection depending availability and try to get one or two different species every week. Because of our limited tank space we do not generally stock large or aggressive freshwater fish, but we can special order fish that you desire. Glo Sharks now in stock, Really Nice!